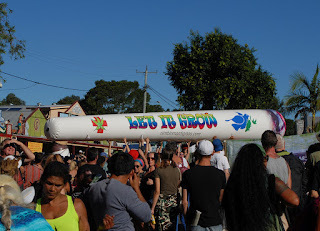 In the far North of New South Wales Australia, a small town called Nimbin hosts an annual pilgrimage to all things cannabis, called the Mardi Grass. Tracing the name’s inspiration, we have to take a few steps back in history. In the Catholic tradition, lent is a period of forty days, when believers fast, abstain from rich food, and repent of their sins. This abstention soon gave rise to a sensible tradition of cooking and eating all the perishable rich foods in one’s kitchen on the day before lent begins, Ash Wednesday. Hence “Mardi Gras” (French for Fat Tuesday). This religious tradition, when transplanted to the swamps of Louisiana by Acadian French settlers, was transformed by its exposure to the other cultures in that hot and fertile climate on the Gulf of Mexico: voodoo, santeria, and other African traditions mingled with native American rituals over three centuries to produce the colourful “Mardi Gras” pageant, famous the world over, and synonymous in our imagination with New Orleans – colourful floats, mind-blowing costumes, and revellers dressed as the living dead. Australians are a happily shameless people when it comes to recycling (don’t say appropriating!) 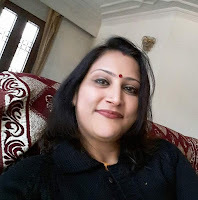 others’ good ideas. In the 1970s (a time when homosexuality was a crime in all Australian states) Sydney’s annual march for gay rights was branded the Mardi Gras. This event, too, has grown world-famous, and done wonders for the image of the gay community far beyond Australia’s shores. By 1993, homosexuality was no longer a crime in New South Wales. Cannabis, though, was (and remains, except for cases of extreme medical necessity) illegal to buy, sell, or possess. 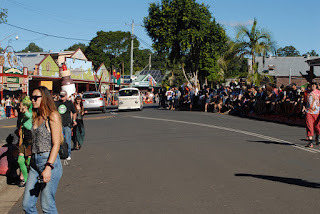 Nimbin’s annual protest against the prohibition of cannabis takes place after Lent and Easter are over, and on the first weekend in May rather than a Tuesday, yet still, as Australia’s annual protest against the prohibition of ganja, it could hardly be named with a more appropriate play on words, than “Mardi Grass”. 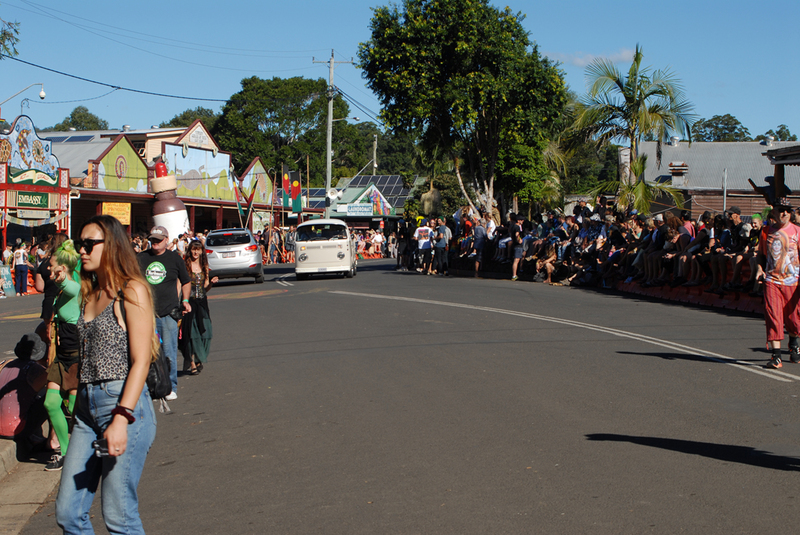 Nimbin became Australia’s counterculture capital in 1973, when a ragtag army of students descended on the town to organise the Aquarius festival. The sleepy community of struggling dairy farms was never the same again, as many of the hippies, stoners and dreamers stayed on after the festival wound down, building alternative communities and going back to nature in the lush rainforest around the township. Twenty years later, the first Mardi Grass was attended by less than 1,000 protesters. Nonetheless, the protest made the TV news, reminding “straight” Australia on the coast and in the state capitals that a growing number of young people were joining the aging hippies and veterans of the 1960s counter-culture, breaking the cannabis laws en-masse and demanding a change to Australia’s outdated and punitive drug laws. If the cops were fighting a war on drugs, well, this was the war on the war on drugs. After 20 years, those in Nimbin still living out their hippy dreams were besieged. 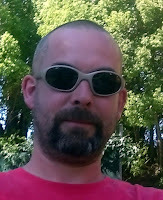 Regular invasive police helicopter raids were a fact of life through summer. Speaking out about drug law reform was suicidal – it made you a target for the uniformed police and the undercovers who moved among the tourists. Despite the danger, some idealists insisted on raising their voices. Among them were Bob Hopkins, who conducted a one-man campaign against the unjust drug laws, Michael Balderstone, who ran the Nimbin museum, and a lawyer named David Heilpern. Along with some likeminded folk, these three formed the nucleus of what was to become the Nimbin HEMP Embassy. HEMP being a recursive initialism for “Help End Marijuana Prohibition”. The first Mardi Grass was the HEMP Embassy’s brainchild. As a protest, the event grew quickly. By the second year, many local people were supportive. 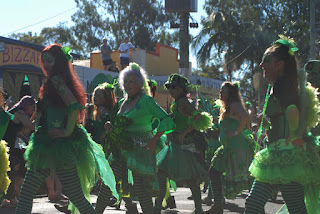 That year, the Mardi Grass rally was preceded by a conference and seminar which included politicians, academics and even health professionals from all over Australia. And this time, 2000 people marched against the madness, prejudice and ruined lives caused by drug prohibition. 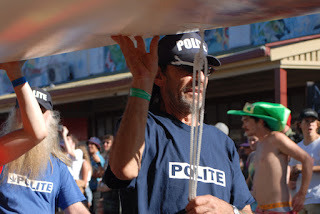 For the fourth Mardi Grass, the protesters had a surprise in store for the police. Sick of the loud and invasive helicopter raids that the police had been mounting throughout the area, the HEMP crew decided that Ghandi-style peaceful protest was the best response. They found out where the officers manning the chopper were staying, and where they'd parked the chopper for the night. While some protesters chained and locked themselves to officers cars, others (30 kilometres South, just beyond the nearest city, Lismore) had chained and locked themselves to the police chopper. Of course, the protesters had also alerted the local press, so when the police came out the hotel door, they were greeted with the sight of their immobilised vehicles and a gaggle of cameramen eager to catch their reaction. While the HEMP Party is a registered political party in Australia, it’s not the hemp party most Mardi Grass attendees care about. 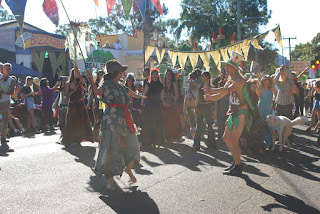 In fact, despite the hemp embassy’s best efforts, many young attendees travel to Nimbin to attend Mardi Grass as a festival, rather than as a protest against prohibition. I’ve even spoken to Japanese tourists who had assumed cannabis was legal in Nimbin. The air is filled with the smoke of hundreds of joints being lit at the same time. A parade of 1970s kombi vans streams psychedelically through the crowd, like a multicoloured handful of huge smarties. Leaded fuel fumes mingle with the ganja smoke. 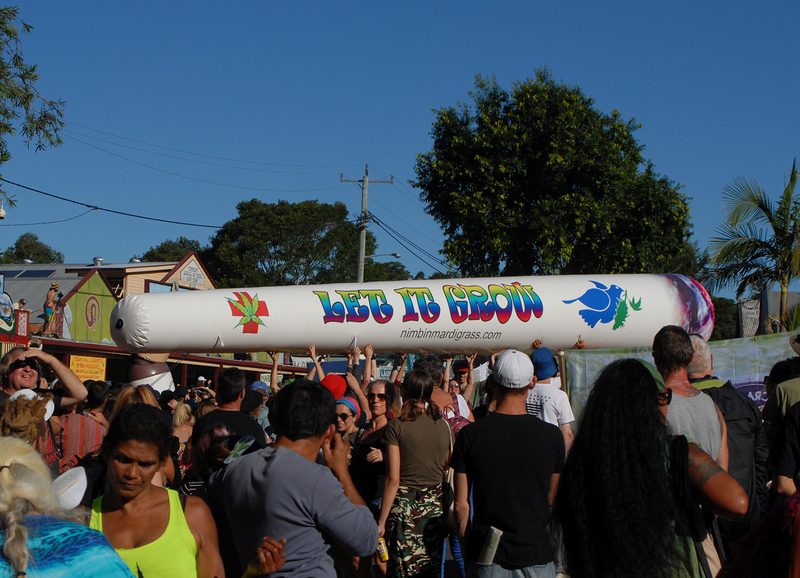 Excited visitors laugh and point as an enormous inflatable “joint” sails across above the crowd, who jump, laughing, to propel it down the hill. Acoustic guitar tunes jangle tunefully across the street. Hip-hop drifts up from the skate-park below. Exclamations can be heard in Hindi, Dutch, Japanese and Yankee. Suddenly, fairies. Green-winged ganja-dancers on rollerblades announce the parade, and floats, stilt-walkers, jugglers and hemp-costumed heroes crowd past and head down to the park. 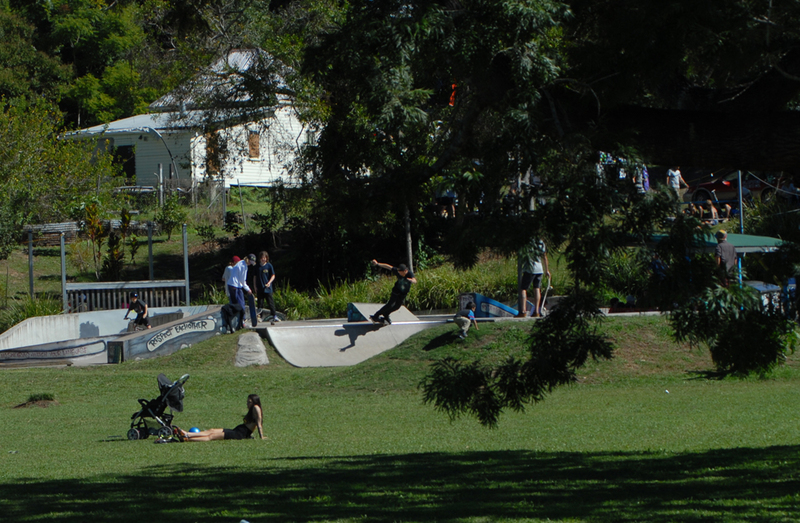 Local produce is going down fast – jam do’nuts and pale ales from Byron Bay; beef and vegetarian curries from Lismore; salty hot chips and freshly baked bread… and local grass, both hydro and bush of course. Down in the park, the stoned chess championship is underway. A café is serving coffee grown on the hill above town… and real ᕙ(⇀‸↼‶)ᕗ bhang to those who know how to ask for it. The police and cannabis growers are limbering up for their yearly (friendly) tug’o’war. Most tourists are congregating around the strangest spectacle of all. Part assault course, part hallucinogenic fine-motor purgatory – it’s the Growers Ironperson contest, where contestants pit themselves against such tests such as crawling through tick-infested tunnels of undergrowth, dragging 20kg bags of fertiliser. Song, dance, speeches, workshops, poems, art exhibitions, hemp fashion shows, drug law seminars, seed swaps and much more will follow for three days of glorious (and often muddy) mayhem. 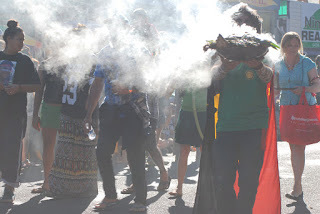 Meanwhile, in a secret location nearby (but not too nearby) The Nimbin Cannabis Grower's Cup is held – the winning strains of ganja in various categories to be proudly listed in the next edition of the Nimbin Good Times, once tasted, toked and tested by judges. It’s nothing like as formal as the Amsterdam Cannabis cup. But it’s a lot more relaxed. 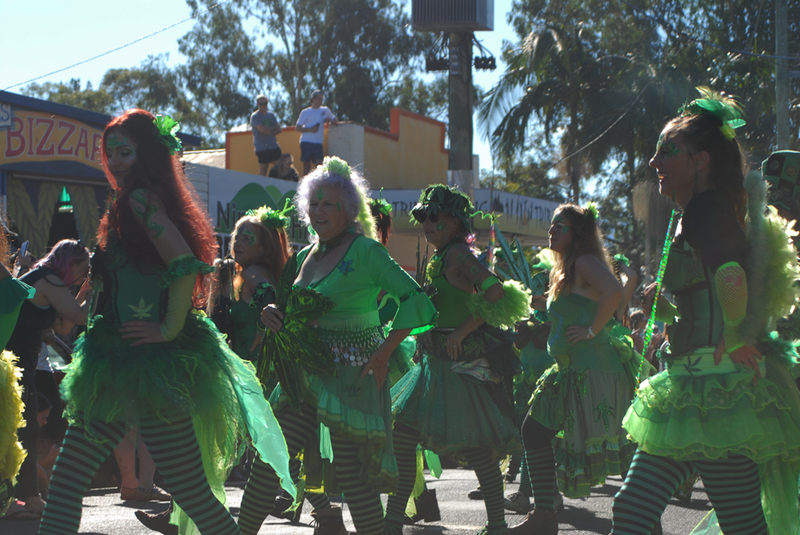 A cynic might call Nimbin Mardi Grass a failure. After 25 years, much of the world has decriminalised cannabis (The Netherlands, Portugal, Brazil, South Australia...) or legalised it completely (Canada, Uruguay, South Africa, California…) but New South Wales hasn’t budged an inch, still enforcing the same damaging prohibition law as in the 1970s (except for minor medical exceptions). Mardi Grass, and the crew who make it happen, are on the right side of history, though. It has been a hard-fought rearguard action through the toughest years of strict prohibition, and the imprisonment of people caught using, buying, or selling the free-growing weed. For that, the world owes a debt to the Mardi Grass, and the brave little town that hosts it. Over the last few years, the focus of campaigning has started to shift, as the inevitability of legalisation has become clear. Industrial hemp is now under discussion, and both corporate funding and licensing decisions loom. Anathema to the hippy counterculture that has long fought for legalisation, but an inevitable corollary to bringing cannabis back into the mainstream. Alongside the industrial hemp stalls in the last few years, there has also been a surge of interest in medicinal cannabis. Symposiums at Mardi Grass now always include medical practitioners with exciting updates about the benefits of cannabinoids in fields as diverse as pain management and counselling for post-traumatic stress. Best of all, Mardi Grass now regularly features speakers from parts of the world where cannabis is fully legal. They come from the futures – all our futures, and they tell us about all the benefits and joys of living in a world without an irrational prohibition against getting high, curing your ills, and making your clothes from the world’s most versatile, nutritious, magical plant. Legalisation worldwide is now only a matter of time, and both the grizzled hippies and the grim-faced cops know it.